Injuries to key men are concerning Northamptonshire in the build-up to their first NatWest T20 Blast match of the season. 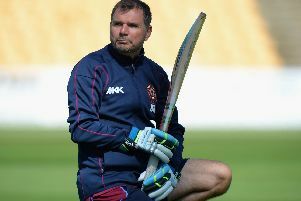 The Steelbacks are in danger of being without their captain and vice-captain for the trip to Durham Jets on Friday night. Both skipper Alex Wakely and international all-rounder David Willey are suffering from problems - although head coach David Ripley is hopeful both will pass tests and be able to play. Wakely was unable to bat in the first innings of the LV= County Championship game against Derbyshire but did come to the wicket at number 11 and played his part in a tremendous battling draw. His role in the game was limited after taking a blow to his hand while fielding. Vice-captain Willey was also hampered after aggravating a groin problem while Josh Cobb was hit on the hand while batting in Northamptonshire’s second innings. Ripley explained: “Alex is seeing a hand specialist in Northampton tonight. “Some of the swelling has gone down and it is marginally improving but we need to assess it again. “It’s not broken so it is not a disaster but at this stage I would say it is 50-50 whether he will be able to play against Durham. “We’ll know more when it’s been checked out but the worst case scenario is he will miss the T20 and Surrey (LV= County Championship) matches. “We hope it won’t come to that, though. “The other concern is David Willey. “He has a bit of a groin problem which he just hurt again while bowling. “It will take a bit of care and attention to get him ready for Friday but we’re hopefull he’ll be okay. To compound the County’s stresses they also had to contend with a vomiting bug which laid low two of their players during the Championship game in Derby. “We’ve had a bit of sickness in the camp which has affected Adam Rossington and Josh Cobb,” Ripley added. “They have both been up in the night throwing up but they should be fine when it is out of their system.